Boba Fett flies over the Pit of Carkoon. Puzzle Cube has four scenes from the Special Edition. You engage the Falcon's engines with a pull and it appears to fly on its stand. You can put Leia inside the R2-D2 playscape and it comes with a movie card. The Death Star spins, opens and you can see sparks inside. Initially the Death Star spinner was pulled from the promotion because it was coming apart under heavy use. It was later replaced by spinners that were modifed to prevent the failures. You can see Vader and Yoda in the Magic Cube, but never at the same time. My favorite. Yoda was the under age three toy that was availabe all during the promotion. 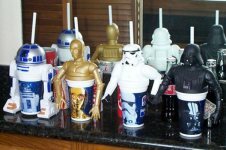 These four cups were only offered outside the US during the Special Edition promotions at Kentucky Fried Chicken restaurants. Each cup came with a vinyl top and a straw. As you can see they make a very nice looking set.